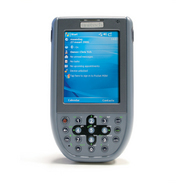 Powered by Windows Mobile 5.0, the PA600 is designed for users who need a compact, yet durable PDA for data collection and real time transactions. Perfect for Retail, Hospitality, Healthcare, Sales Automation, and Field Services, it will enable you to select the features best suited to fit your business. Equipped with a large color LCD touch screen, integrated laser scanner, 18-key keypad, and 520MHz processor, the PA600 was designed to meet the demands of today’s applications. Compact enough to fit in your shirt pocket, it is the lightest PDA in its class, weighing in at just 290g. The PA600 may be small in proportion, but is extremely powerful and durable. With an IP54 rating to resist dust and water, the PA600 can also withstand 4-foot drops to a concrete floor. When it comes to capturing data, the PA600 offers a variety of model options- integrated barcode scanner, keypad, touch screen, and optional Bluetooth available, all depending on your own personal requirements.